We asked Michael Spearman of Everything Everything a few questions. Your latest album, A Fever Dream, gets political. How do you think musicians can impact today’s increasingly populist Western world? It’s hard to say, especially as there are so many voices in the world now, many of them loud and fighting to be heard, so impact happens when the statements are outlandish and extreme, unfortunately. Lyrically, that’s something Jonathan has always explored, especially with the last two records. Ivory Tower is about ‘keyboard warriors’ trolling on the internet with CAPS LOCK ON, desperate for their voice to cut through. We do live in an increasingly populist world so perhaps musicians have more of a platform than ever, but we don’t really think in those terms. I don’t think Jon wanted to just add his opinions to the ever-increasing, overwhelming pile of everyone’s opinions. He’s more interested in exploring ideas and getting into the heads of other people, even if he doesn’t agree with them. I think our hope is just that we’re adding something of value into the world, even in a small way. We always aim to make music that excites us and enters fresh territory. It’s a privilege that we’re allowed to do that and we’re very grateful. The lyrics to the new album have been dubbed “bizarre” by both The Guardian and The Independent. What made you choose abstraction over accessibility? Jonathan has always been abstract and oblique with his lyrics. Personally I think they’re much less abstract and more accessible than on the first record, in a good way. Sometimes he’s incredibly direct and ‘on the nose’ lyrically and those lines really stand out effectively. Even if the listener doesn’t know exactly what every line means they can probably access the emotional note they’re striking, be it anger or melancholy or anything in between. Abstraction allows room for the listeners interpretation, which is more interesting to us than being told exactly how to feel. I think, generally speaking, good art requires a little of the listener/reader/viewer for it to resonate and live with them for a while. It’s boring to just put it all on a plate. 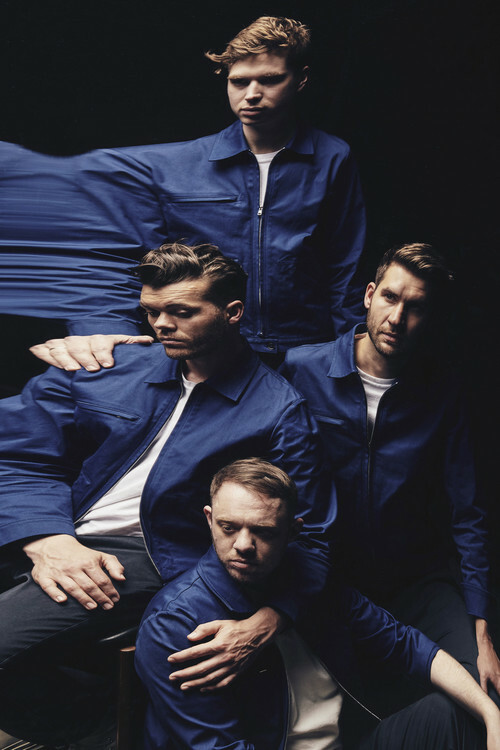 Everything Everything is often dubbed “nerd rock” or “math rock”. Is that how you would describe the bands vibe? It’s not really for us to say... The band has existed for ten years now and have been labelled a whole range of things in that time. I’m glad we haven’t been neatly pigeonholed as it allows us to move around more. I suppose in some ways we’re an ‘indie’ band but that doesn’t really mean anything as a genre anymore. We pulled in a lot of R&B -as well as ‘math rock’ influences - at the beginning and there’s a lot of 90’s electronic music influencing A Fever Dream. ‘Indie’ feels very governed by old rules, which we know and like but don’t really play by. In the broadest sense I think ‘pop’ is more freeing. I’d rather be a pop band with strange edges than anything else. We like the album cover. Can you talk me through the album artwork-choosing selection? Thanks! We wanted something that uses old-school analogue processes, like the music on A Fever Dream. The mass of melding bodies are meant to be both beautiful and dark, clear and nebulous. To us it represents society pushing and pulling in different directions, not knowing which way is up. Have you guys got ideas for the next record, or are you taking a break? We haven’t really started writing it yet but there are always ideas bubbling away, which normally come together between Jon and Alex on the road at first, and then the four of us play around with them in a room. You’ve played Norwich before. What’s your favourite thing about the city? You guys tour a lot. Can you share your top tips for acing life on the road? All the vowels: Alcohol, Earplugs, Indian food, (the) Outdoors, Underwear. What can Norwich expect from your upcoming gig? Magical Mystery Tour times ten.